I wanted to try a little something different, and this is a cookie recipe that I haven’t tried before. They turn out pretty good. They weren’t the best cookies I’ve ever tried, but they’re chocolate, so in my book, you can never go wrong with chocolate. The only thing I really didn’t like was, the picture in my cookbook showed that they didn’t flatten out so much. So I was a little disappointed with the appearance after they were done baking. The other downfall was that you have to refrigerate the dough for a while, so make these when you have some time on your hands. My kids had a lot of fun make these with me though. Although it does get a little messy, it’s a lot of fun for kids to get there hands all sugary and roll the dough balls into the powdered sugar. So this recipe was good, just not great. Hope you enjoy and have a great day!! In a large mixing bowl, combine the sugar, eggs, oil, chocolate and vanilla. In a separate bowl combine the flour, baking powder and salt. Gradually add the sugar mixture to the flour mixture and mix well. Cover and refrigerate dough for at least 2 hours. Preheat oven to 350 degrees. 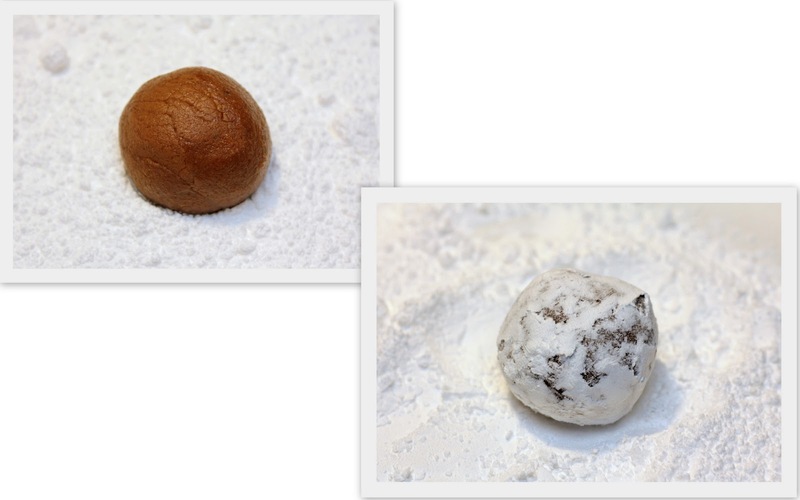 With sugared hands, shape dough into 1 inch balls. Roll in confectioners’ sugar. Place 2 inches apart on greased baking sheets. Bake for 10-12 minutes or until set.